Tune composer Phoebe Palmer Knapp (1839-1908) played a melody to Fanny Crosby and asked, "What does the melody say to you?" Crosby replied that the tune said, "Blessed assurance, Jesus is mine!" and proceeded to recite the entire first stanza of the now-famous hymn. Knapp was one of several tune writers that worked with Fanny Crosby. It was not unusual for one of her texts to be inspired by a preexisting tune. Knapp was the composer of more than five hundred gospel hymns and tunes. An author of more than 8,000 gospel hymn texts, she drew her inspiration from her own faith. Crosby published hymns under several pen names including "Ella Dale," "Mrs. Kate Gringley," and "Miss Viola V. A." Her hymn texts were staples for the music of the most prominent gospel song writers of her day. Frances Jane Crosby's hymns have historically been among the most popular songs sung by Methodists. "Blessed Assurance" (1873) is one of the ten most popular hymns sung by United Methodists according to Carlton Young, and it is one of eight Crosby hymns in The United Methodist Hymnal. "Blessed Assurance" was published in 1873 in the monthly magazine edited by Joseph Fairchild Knapp and Phoebe Palmer Knapp, Guide to Holiness. Editor John R. Sweney included it in Gems of Praise (Philadelphia, 1873), and Knapp also chose it for "Bible School Songs" (1873). Perhaps the biggest boost came when it appeared in Gospel Songs, No. 5 (1887) by Ira Sankey and was sung extensively in the Moody and Sankey revivals in Great Britain and the United States. It has been a part of Methodist hymnals since 1889. This hymn has inspired many singers ranging from those in evangelistic crusades to theologians. Don E. Saliers, William R. Cannon Distinguished Professor of Theology and Worship Emeritus at Candler School of Theology, Emory University in Atlanta, borrowed a portion of the opening stanza for his liturgical theology text, Worship as Theology: Foretaste of Glory Divine (1994). If one enters "foretaste of glory divine" into a Google search, numerous sermon titles appear that incorporate this phrase. YouTube renditions of the hymn abound. Crosby captured the poetic essence of the Wesleyan understanding of Christian perfection in the phrase, "O what a foretaste of glory divine!" The entire hymn is focused on heaven, a place where "perfect submission" and "perfect delight" [stanza 2] will take place. The earthly existence is one of "watching and waiting, looking above" [stanza 3]. As we submit ourselves to Christ and are "filled with his goodness" and "lost in his love" [stanza 3], we are remade in Christ's image and are moving toward Christian perfection. This hymn appeals to the senses in a rich way. Not only do we have a "foretaste of glory," we experience "visions of rapture [that] burst on my sight," and we hear "echoes of mercy, whispers of love" [stanza 2]. The refrain calls us to "prais[e]. . . my Savior all the day long," echoing I Thessalonians 5:17, "Pray without ceasing." Middle class women in nineteenth-century United States had little voice in worship, however. One of the only ways for a woman to claim the authority to be heard was by direct personal revelation from God. 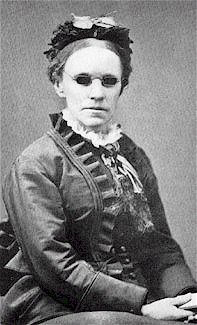 Fanny Crosby readily claimed God's personal revelation as a source for her hymns; her personal revelation then became a communal inspiration as Christians throughout the world sang her hymns and confirmed her faith experience as their own.